Wonderdog Premium is a delicious Chicken & Rice hypoallergenic dry dog food, which provides a complete, all-natural diet for active and working dogs. Formulated with chondrotin & glucosamine it supports joints. 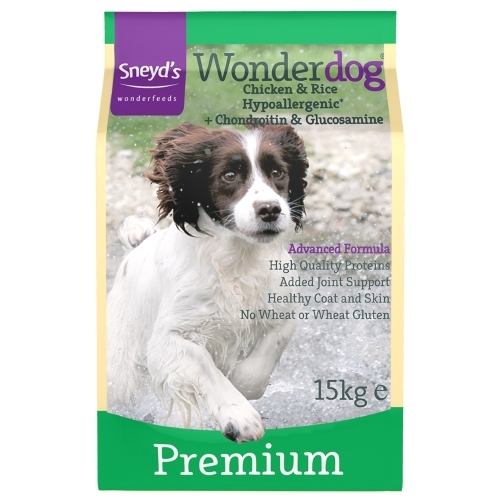 Free from wheat, soya and dairy it’s ideal for dogs with sensitivities! •	30% Chicken content and 30% rice content. •	Chondroitin and Glucosamine to support and maintain healthy joints. •	Suitable for all breeds of dog. •	Helps maintain ideal body weight. •	Rice provides slow releasing energy. •	Contains beet pulp – this provides a source of dietary fibre to support healthy digestion and good stool formation. Crude Protein 24%, Crude Oils & Fats 12%, Crude Fibre 3%, Inorganic Matter 8%.